In recent times, I have been on the lookout for new breakfasts. I am terribly difficult to drag out of bed in the morning, (sorry honey), which means I'm always hurriedly running off wherever I'm meant to go. I'm almost always starving when I wake up, am also on a budget, and am trying to eat vaguely semi-healthily. So, I've been trying not to let my regular breakfast become a quickly inhaled muffin and latte. Nigella Express has been a surprisingly profitable source of suitable breakfasts. Avocadoes are currently cheap cheap cheap!! Wonderful! 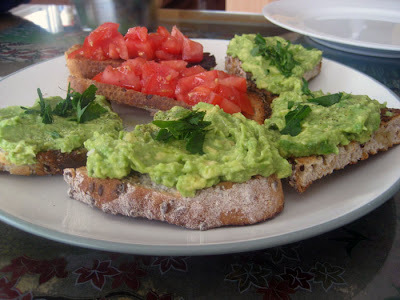 You don't really need a recipe for bruschetta, (grilled bread + olive oil + salt + pepper + chopped tomato or avocado mashed with lime juice) but it was good to be informed that it makes a fantastic breakfast. And healthy too, with the lycopene-filled tomatoes, low GI sourdough toast and the polyunsaturated fat from the avocadoes. I've never been a fan of Nigella's 'catchy' recipe titles, which seemed to coincide with her At my Table column and her short-lived (but not that bad, really) Nigella! program. I mean, why a "No Worries" chocolate mousse? However, I have always definitely been a fan of the recipes themselves! So back to the point. Nigella's take on a breakfast smoothie contains a frozen banana, ovaltine (Milo for me, thanks), milk, honey and coffee powder, with peanut butter as a suggested substitute for the coffee. This combination is, unsurprisingly, delicious. I think I've made it at least a dozen times since I got the book - yum yum. However, it's not a very filling breakfast, and I assume it has a rather high GI rating. I tend to make this to tide me over when I know that a real breakfast or a big lunch is a few hours away. You know, yum cha, the gym, a morning class. Incidentally, I don't know why everyone says that smoothies are a quick breakfast; I always find them quite fiddly to make, and, unlike toast or a muffin, not easily portable. Washing the blender afterwards is also a bit of a pain, especially if you don't have time to do it straight away, and you thus need some serious scrubbing to get it clean. This is simplicity itself to make. 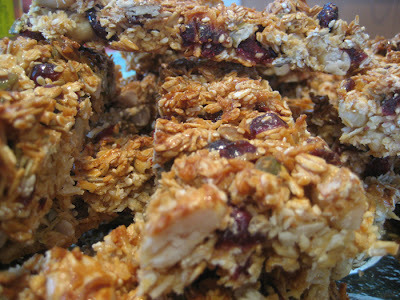 Mix together oats, dried cranberries, peanuts, shredded coconut, some mixed seeds and a tin of condensed milk; then spread into a tin and bake at a superlow heat for 1 hour. Mmm mm! Smells dee-licious! And it tasted just as good. 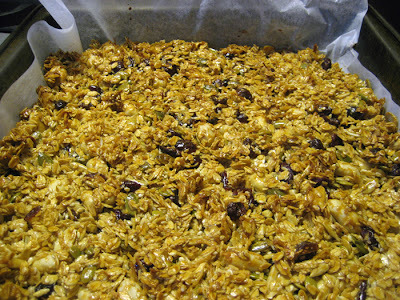 The recipe made 16 bars, which lasted for about a week and a half in my house. My dad loooved these, as did I. I haven't decided whether or not these bars are healthy;but given that it's a Nigella recipe, I'm not too optimistic. However, considering that it contains no oil or butter, and that the condensed milk I used was 98.5% fat free, I'd say it's not too bad. I was also impressed by how low-GI they were. I found that one bar, eaten at breakfast time, kept me super-full right up until lunchtime and stopped me hoeing into sugary snacks at morning tea time. Bonus! For my picnic on Saturday, I wanted cupcakes. I wanted them bad. 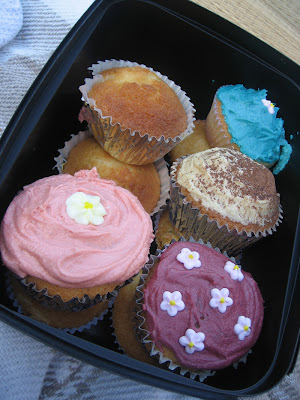 Cute, sweet, individual cupcakes, pretty as a picture and perfect to pop out of my picnic basket at a moment's notice. I wanted them covered in swirly (even pink) icing, and covered in sugar flowers. I know I've previously mentioned that I'm sick of the ubiquitous perfect pretty cupcake, but for some reason I just really wanted them for the picnic. Where else to turn but The Magnolia Bakery Cookbook? And to their original, basic, essential recipe - the traditional vanilla birthday cake topped with traditional vanilla buttercream? I have made them once before, but this time, I did the icing a little differently. The main difference was that I used unrefined golden icing sugar. It's not easy to find, but if you do, it's well worth having a go with it. Because it is unrefined, the sugar is a mellow off-white, caramelly colour, and has a corresponding depth of flavour that ordinary icing sugar lacks. The only problem I found with this sugar was its texture - in its box, the sugar it had compacted into a rather solid cube, which took a few good whizzes in the blender, as well as some vigorous sifting, to sort out. Once, however, the de-solidified sugar is mixed with butter, vanilla and a dash of milk, and is strongly beaten for a good 5-10 minutes, it becomes a very attractive, buff-coloured icing. ... or any colour that takes your fancy. In the above photo, we also have a cocoa-dusted version, a salmon-coloured one and a sprinkle-rimmed swirly one. Below, we have Berlin "Love Parade" electric blue, one of which is rimmed with multicoloured sprinkles - appropriate enough for the theme; a few apricot coloured cupcakes; as well as the buff beauties on the right hand side. Those turned out to be my favourites. I love, love, love the vanilla cupcakes! They remind me of the patty cakes my mum used to make for our childhood birthdays, which my cousin (and fellow picnicker) Catherine loves, and requested for her 18th birthday not too long ago. Both are vanilla scented, soft and light, with a slightly crunchy top. The icing, on the other hand, is not one of my favourites. (And yet, for some reason, I keep making it. Perhaps I keep hoping that they will, one day, taste as good as they look). I really like the delicately milky taste of the icing, but the amount of sugar - 8 cups to 112.5 grams of butter - is huge. I'm not sure that the cupcakes don't taste better without the icing at all, which would rather defeat the purpose of the whole "cute pink cupcake making" exercise. So, I am now on the lookout for a new icing recipe, if for no other reason than to unleash my inner artist. Any recipes or ideas for a stiff and swirly icing, that's not too sweet and takes colours well would be greatly appreciated. 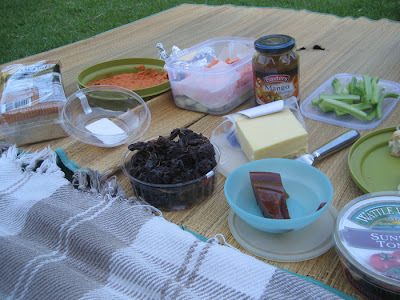 Picnic on a sunny day. Or "Get that damn swan away from me!" 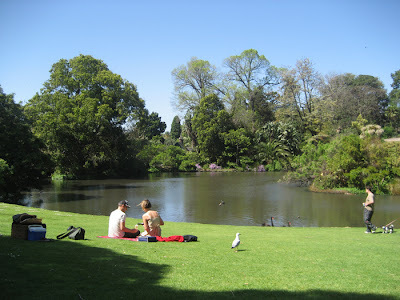 Saturday was a lovely warm and sunny day, so 2 of my friends and I decided to do the touristy thing and headed down to the Botanic Gardens for a picnic. 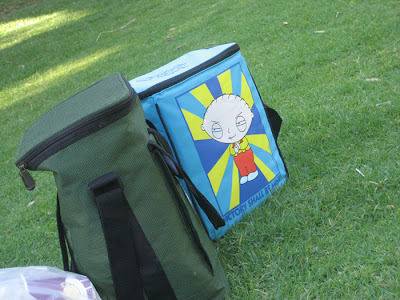 ... and a couple of trendy cooler bags to hold it all in! It was a great, relaxed afternoon. Except for when we were ambushed by scary giant black swans. 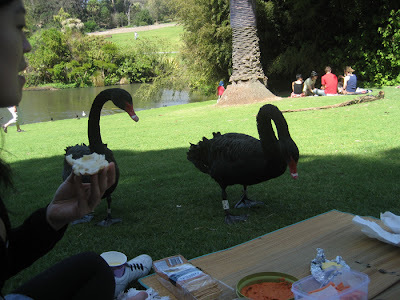 One member of our party holds a traumatic experience of being bitten by a swan as a small (cute) child, and was not impressed by the Botanic Gardens' bold swans who love to come up and annoy unsuspecting picnickers. I was not that traumatised, but I was severely worried that they would steal (or peck) our carefully prepared food. Note the petrified expression on my face as the swans come ever closer to our picnic. But in the end we just threw bread at them and they went away. Phew! Tonight I present to you the first few recipes I've tried from Jill Dupleix's Lighten Up. We had the whole family home for dinner on Saturday, and I thought it was time I put the Nigella recipes aside for a (very) short while and try something a bit healthier. 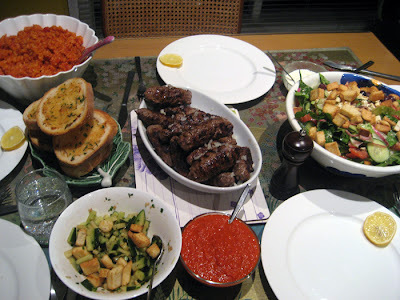 The cevapcici and soufflés are from Jill's book, whilst the rest came from the internet and other crafty sources. 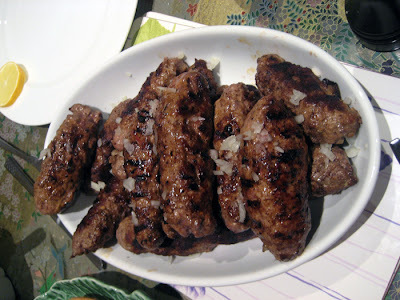 Cevapcici are skinless spicy grilled Greek sausages. I'd never had them before, but according to a friend of mine, they are all the rage in Greek restaurants in Germany, and are always served with tomato rice and spicy sauce. (Avjar, a spicy Croatian sauce, is Jill's suggested accompaniment which I managed to find at the supermarket). We made a Greek salad to add some much needed lightness to the meal, and we made garlic bread to use up a massive loaf of sourdough that I'd acquired that morning. To garlic-ify the bread, I made a mixture of minced garlic, parsley, and buttery-yet-heart-healthy rapeseed oil and brushed it onto the bread slices. 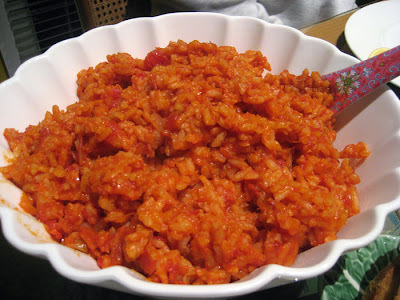 We found a recipe for the tomato rice on the internet - link here. This recipes calls for you to cook rice via the absorption method, with a LOT of sautéed onions, tomato juice and a tin of tomatoes. It's very easy, and very flavourful. The lunch took 2 of us the better part of the afternoon to prepare, but was a fun and relaxing way to spend a quiet day. Cevapcici. They are vastly healthier than conventional sausages, being made with lean beef and lamb, without preservatives, skins or filler. Wonderful. Incidentally, we all found them quite filling, and most of us only had 2 sausages with all the accompaniments. Now, onto dessert. 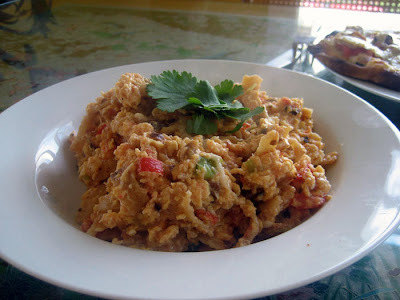 This is a very simple recipe, containing only eggs, crushed pineapple, shredded coconut and sugar. Lots of sugar. 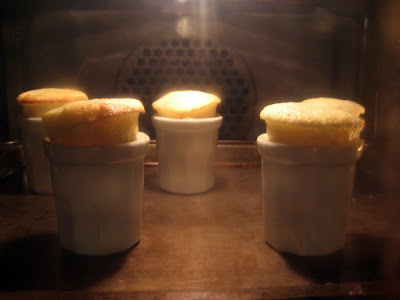 As Jill says in her introduction, they are an unintimidating, easy soufflé - stir, whisk, fold, bake. Done. In the oven. 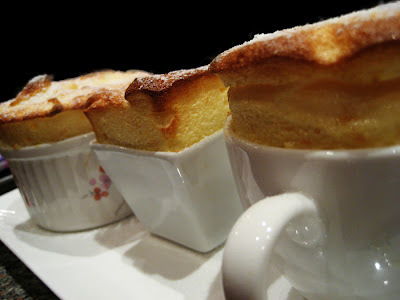 You know, the main reason I made soufflés was to test out these gorgeous dishes my good friend Lisa sent me as a graduation gift. They're Pillivuyt, (my fave brand! ), and are technically 'condiment' pots, but they can be used for anything. They come in a set of 5, with a cute wooden paddle for each one, and a porcelain base to keep them all together. (More photos to come). I love how petite they are, and that they look like baby latté cups. Thank-you so much Lisa!! 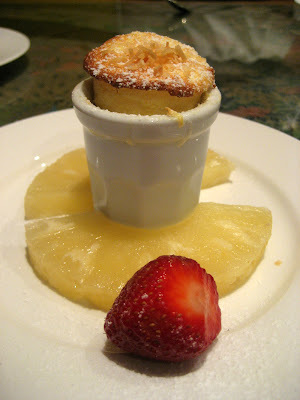 FYI, they are very miniature, cute pots, and make a delectable-sized dessert! Of course, using such small containers meant that there was a lot of mixture left over, and as you can see in the first photo, meant I used a bunch of random ramekins to cook the excess. I have to say, as much as I loved the cevapcici, I was really disappointed by the dessert. They were just too sweet - incredibly so, and we could only manage the tiniest amount before giving up. Oh well, plenty more recipes where they came from! My next batch of recipes from Nigella Express generally fall into the "tasty but not pretty" category. 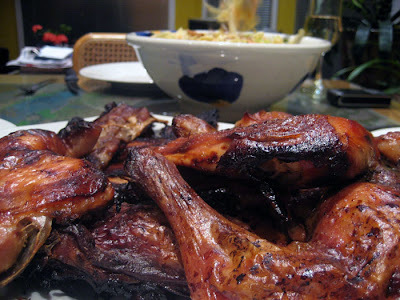 The chicken & ribs were made by special request of my father, who loves all forms of stickily roasted meats. This recipe comes from the Quick, Quick, Slow chapter, which has recipes that can mostly be prepared in advance, and are designed to fit in with a busy lifestyle. With this recipe, you just marinate some chicken pieces and pork ribs overnight, and bake them the next day. Ta-dah. Tasted great! The only problem was that the pan and pork ended up greasy and mushy - I'd gotten "pork ribs" at a butcher which had no bones, little meat, and heaps of fat. The small amount of meat we did manage to scavenge, however, did taste good. So I look forward to trying this again, with proper boney pork ribs. The chicken remained unscathed. 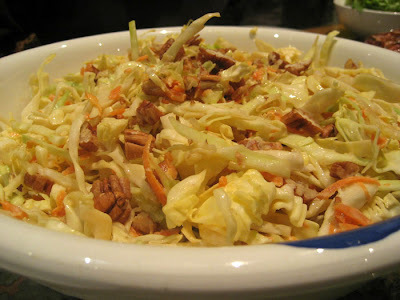 The coleslaw is the suggested accompaniment for another chicken dish in the book, but I thought it would go well with this one, seeing as both the salad dressing and the meat marinade have similar ingredients. It just needs a bit of chopping and a bit of stirring - easy to do while the meat is cooking. Crunch crunch, munch munch. The salad made a nice, refreshing accompaniment to the rich chicken 'n' ribs. 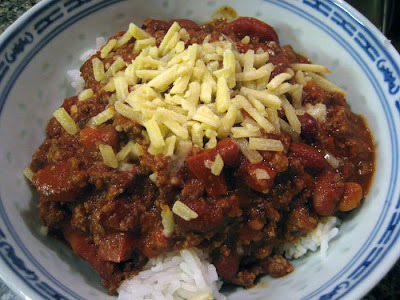 I made the chilli one night after a long day at work - bought all the ingredients at the supermarket on the way home, started cooking as soon as I walked through the door, and dinner was ready in about 30 minutes. Very comforting and substantial. I felt that the chilli had a bit too much chorizo, (I'd easily halve the chorizo next time), but the taste was good nonetheless. My chance to make the deliciously cheesy Naan Pizza come about one day when I discovered a leftover garlic naan in my fridge, a remnant of the previous night's takeaway. Score! The naan is covered with a squished tomato, sliced mushrooms, thyme, and cheese, before being baked until crispy and bubbling. Fabulous. 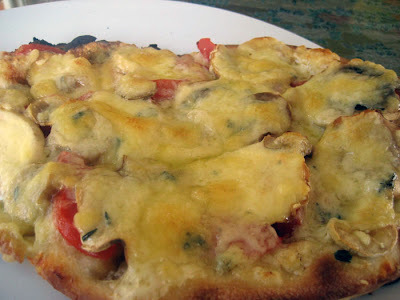 We had the naan pizza with the Mexican scrambled eggs for a (surprisingly not hungover) Saturday lunch. And they tasted as good as they look! That is to say, they didn't taste good at all. These eggs include fried pieces of tortilla, spring onion a diced tomato and some chilli, as well as the obvious eggs. It sounded good on the page, but on the plate it just seemed like the tortilla flavour overpowered the dish, and the result just seemed watery. Not recommended! At least the naan pizza was good! Just a quick post to remind y'all of my favourite restaurant, Tutto Bene. (You may remember it from such posts as this year's birthday dinner). I popped in with a friend of mine one Sunday afternoon, when we wanted a special lunch that wouldn't break the bank. Lovely views, friendly service, insanely good risotti. What more would you want? I think Jill Dupleix is fantastic. In fact, she was the first food writer I ever got into, and whose recipes I started cooking, back when I was a mere 12 years old. I remember constantly borrowing her book, New Food, from the school library (yes, I went to one of those Kew private schools that has trendy cookbooks in their library), and reading it from cover to cover. A few years later, I bought the fantastic Old Food, which has become an often-used book. Since then, even though the Jill recipes may have taken a back seat to other celeb chefs (*cough* Nigella *cough*), she's always been a favourite of mine. Her recipe for porridge from Old Food has proved to be a surprise hit in my (Chinese, non-porridge-eating) household. I made a batch of it a few months ago, in an attempt to be healthy, and we've been wolfing it down ever since. As you can (probably) see from the above photo, Jill's porridge contains a mixture of grains - rolled oats, braley flakes, rye flakes, sesame seeds and linseed - all of which I managed to pick up at a local organic store. The idea is that you mix up a large quantity of all the grains, and store it in a huge jar. This will last you many, many breakfasts. At first, I didn't think my family would like it very much, but I was wrong! Mum's never really eaten porridge, and thinks it's heavy and weird. However, she loves this version, and especially likes the crunch and texture from the various grains. Now that our supply is getting low, she keeps asking me if I'm going to make more. This is a good sign! I think she eats it even more than I do. We usually eat the porridge cooked in water, with a small splash of honey or a scattering of dried fruits for sweetness. Porridge makes a fabulously healthy breakfast. Let me explain why. Oats are high in soluble fibre, which travels slowly through the body and keeps you feeling full for longer. This also means they have a low Glycemic Index, and prevent the rapid absorption of glucose into the blood stream - good for those people who need to control their sugar levels and avoid sugar highs/lows. Oats also help to reduce blood cholesterol because they prevent bile being reabsorbed into the system, meaning that the liver gets its cholesterol from the blood (Source). So there you have it. A few weeks ago, I came across a copy of New Food in an op-shop, and just had to buy it. I finally have my own copy! And last week, Jill's new book Lighten Up was released, which I instantly bought. It is full of healthy and interesting recipes; the type of food she and her husband (also a food writer), have been cooking and eating to lose weight whilst still enjoying good food. (Yay! A healthy recipe book written by a food writer!) I plan to be cooking from it a lot! They will be a nice way to balance out all the Nigella Express recipes that I'm making. So, in the hope that some of you will enjoy this super-healthy porridge as much as my family does, and that you'll go out and buy some Jill Dupleix books, here is the recipe for her brilliant porridge. Mix 1kg rolled oats, 250g barley flakes, 250g rye flakes, 100g sesame seeds and 50g linseed, and store in an airtight jar. When you want to eat, mix 1/2 cup of grains with 1/2 cup of cold water in a saucepan, stirring briskly with a wooden spoon until creamy. Add 3/4 cup cold water and bring to the boil, stirring. Reduce heat to a simmer, and cook for around 10 minutes, stirring occasionally until grains are soft and bouncy, and the pot suddenly smells sweet and porridgey. Pour into a bowl, and serve. Top with a sprinkling of brown sugar or honey, and a little milk. If you have Nigella Express, you will have noticed that Nigella is obsessed with wraps! Tortillas, mainly. She uses them in a variety of interesting ways - as a trendy party treat filled with raw tuna and crab, as a crunchy addition to spiced scrambled eggs, or, predictably, as a sandwich. I have to admit, however, that I've never really been a wrap enthusiast. Until this book, my greatest experience with wraps had been purchasing extra-hot chicken wraps at Nando's. (Delicious). That's not to say I hadn't tried. Coincidentally, a week before I got Nigella Express, I bought some wholewheat mountain wraps as part of my whole healthy family thang. They looked nice, and I thought they'd be healthy. 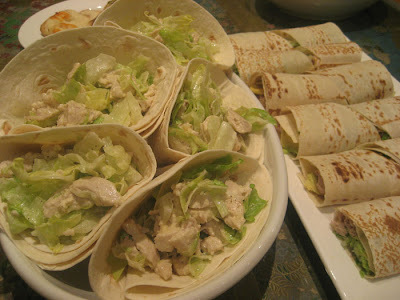 But, I couldn't figure out what to do with the wraps, and they have been been sitting in my fridge, alone and uneaten. Lucky for me, Nigella Express arrived about a week after I bought those wraps, and were filled with great ideas on how to use them! 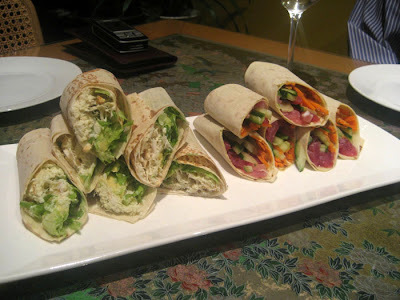 We made Nigella's tuna wraps, crab wraps and quesadillas for a midweek dinner, after coming home from work, and before rushing off to a physio appointment. How very express! So, in the first photo we have Nigella's tuna wraps (right) and crab wraps (left), which come from the Razzle Dazzle party chapter, and finally gave me a way to use up those wholewheat mountain flatbread wraps. For the tuna wraps, the bread is brushed with a mixture of mayonnaise (Japanese Cupie mayo all the way! ), wasabi and sesame oil, then layered with fresh raw tuna, and thinly sliced carrots and cucumber before being artfully rolled up and sliced. For the crab rolls, you mix crab meat (I used tinned; don't tell anyone) with the mayonnaise mixture, and place it on the flatbread with avocado and shredded iceberg lettuce. Easy peasy. But not quite Japaneasy. Here we have the quesadillas from the Speedy Gonzales Mexican chapter. 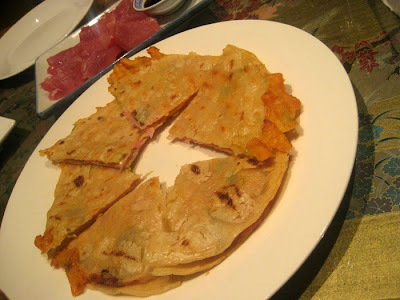 Each quesadilla consists of a corn tortilla, filled with ham, cheese, finely sliced spring onions, jalapenos and coriander. It is folded in half, brushed with oil and grilled on each side until hot, crispy and bubbling. I think the tortillas I bought were pretty average - they broke in half as I tried to fold them. But, never fear, we just slapped 2 tortillas together to make each quesadilla. (In the background of this photo you can see the extra tuna I bought at the market, eaten sashimi style. Yummo). The wraps were very popular with my family. Mum loved the crab wraps, and I thought the tuna ones were fantastic. As a bonus, they were both rather healthy! Full of omega-3 fatty acids and vegies, and with only a small amount of mayonnaise per wrap. (Although actually, I think crab might be high in cholesterol. Next time I might use canned tuna instead). The quesadillas were also very tasty, but I can't see myself making them over and over again. Not to worry, plenty more tortilla recipes where they came from. I woke up one Sunday morning, and was suddenly felt like baking. I decided that I wanted to try Bill Granger's famous coconut bread, to use up my remaining shredded coconut. So, I started pottering around the kitchen: turning on the oven, measuring out the coconut, and so on. However, disaster struck when I realised that the recipe needed 2 eggs, and I only had 1. I didn't want to walk to the shops, but I still wanted to bake (obviously), so I had a flick through my recipe books to try and find a suitable breakfast recipe with easy ingredients. The solution? Nigella's lemon and raspberry muffins, from How to be a Domestic Goddess. I always seem to have a stash of frozen raspberries in the freezer, as I feel compelled to stock up when they're on special at the supermarket. Additionally, these muffins contained lemon juice and milk, rather than the more recherché buttermilk that many muffins need. It worked, more so than the buttermilk that I've tried in the past. I think this could even be the best muffin recipe I've made. They were tender and light, and had a lovely crispy top. Just like the trendy muffins I buy for breakfast in dingy laneway cafes when I'm running late for class or work. Yum yum. I'll definitely be using this muffin recipe again, with other fillings. Pear and ginger? Ricotta and lemon? Raspberry and white chocolate? Strawberry and dark chocolate....?